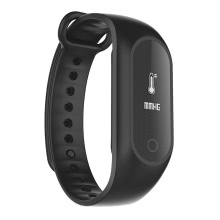 B15S Blood Pressure & Heart Rate Smart Band, Real-time accurate heart rate detection, care about your health, sports, sleep and make your life more secure. 0.86" clear OLED screen, hand touch to operate. Comfortable TPU strap with solid PC case. Swiss NRF51822 Micro Processor, higher performance, safety and stable. BT 4.0 transmission, working range up to 10 meters. Dynamic 3 axis heart rate sensor, faster speed and accurate. IP67 Water-Proof: for rain and shower. 80mAh rechargeable battery, low consumption and long standby. Support Android ≥4.4, and IOS ≥8.0 smartphone. Multi-Functions: Pedometer, Calories, Heart Rate, Blood Pressure, Blood Oxygen, Sleep Monitor, Call/Information Remind, Distance & Time, Alarm, Anti-Lost, Stopwatch etc. 1. Before usage, please download app from store or scan QR code on user manual. 2. Equipment Requirements: (a) for Apple&apos;s device and Android device with BT 4.0 (b) Mobile Devices installed with Android 4.4 or above, and iOS 8.0 or above.